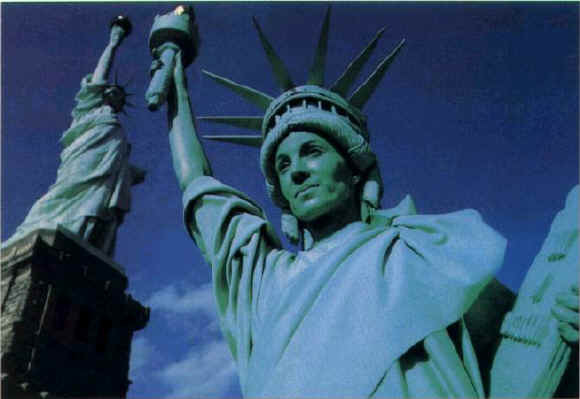 American icons for hire -- contact the Statue of Liberty entertainer, Living Liberty! BEGINNINGS: I was teaching art to schizophrenic adults in Iowa and one of my students told me I looked like the Statue of Liberty. At first I just made a diagnostic note about his behavior, but his comment stuck with me. BREAKING INTO THE BUSINESS: Winning the National Statue of Liberty look-alike contest in 1986. APPEARANCES: I do meetings, conventions, parties, and school functions. I also appeared in the movie Joe vs. the Volcano. The writer saw me in Washington Square Park in New York and wrote a special role for me. ENDURANCE LEVEL: I can hold the statue pose for about 20 minutes. If I don't move at all, people will walk right by without knowing I am alive. LITTLE-KNOWN FACTS: I also perform a Liberty rap song I wrote, and at elementary schools I do a slide show about the Statue of Liberty and civil liberties that teaches kids and anti-drug message. ASPIRATION: To make a difference in the world. WORST PART OF THE JOB: When people try to tickle me. CONTACT: Jennifer Stewart, (718) 935-1157.